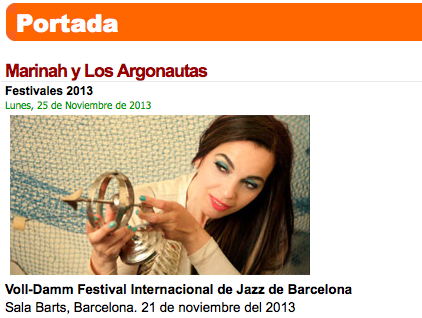 Miguel Amorós reviews Marinah show at Sala Barts in Barcelona for the B!Ritmes Online Magazine. An act within the eclectic line up of Barcelona's Jazz Festival, the concert started with the song Rayo de Luz (dedicated to her son) slowly she began conquering the audience that night. With outstanding trumpet solos from Carlos Sarduy and flamenco guitarist Tuto, Marinah left a good impression and ended up taking the audience on stage to dance some of the famous songs of her previous group Ojos de Brujo. Click on this link to read the full article.